Three years ago, I wrote about my coffee purchase at a fast food establishment and how what transpired enhanced my appreciation for Starbucks. This week, I was reminded of this post when I pulled out a receipt from earlier in the day and noticed I had been given the senior discount. Like the fast food cashier who took payment for my coffee, this cashier had looked all of sixteen. Friends, this is like a gift that doubles as a sharp kick in the gut when it is given (not offered, by the way, but given, just as with the coffee three years ago) to those of us who are only mildly middle-aged. Hey, here’s a free dollar that will also lower your self-esteem! We appreciate your business! Please come again! I like to think I wasn’t the only mildly middle-aged person this boy gave the senior discount to that day. (As a fascinating sidenote, he had this weird thing going on where, during the entire transaction, his facial expression made him look like he had serious anger issues but his voice was soft and almost hesitant. It was a little disconcerting, what with the face and the voice contradicting each other throughout. I wouldn’t recommend speed dating, really, in his case, as an effective mode for forging relationships. Other than that, however, he was quite lovely.) But I don’t know that this was the case, and this stuck in my craw a little after I stopped laughing and creating new wrinkles for myself, which got me to thinking about my earlier post. Recently, I experienced a situation that will live in Island Family infamy. On the tail end of a road trip, I stopped for a late night cup of coffee to keep me awake while I drove. I’d been holding out for a coffee shop, but when it got past ten and I still had quite a bit of driving to do, I stopped at the first fast food restaurant that looked open. When I ordered inside, the cashier, in full-on monotone, told me my coffee would be thirty-three cents. I stared at her for a minute and asked her to repeat herself, thinking I’d misheard. She said the same number again. I gave her a quizzical look, and when she stared blankly back at me, I questioned it. Well, not exactly, as it turns out. “Senior coffee’s thirty-three cents,” she answered. Honestly, I thought I’d misheard what she said yet again. After another repeat, I realized I had inadvertently stumbled into a special, unpublished circle of Dante’s hell set aside just for me. See, I was the only customer offered – no, given – the senior coffee, despite the two clearly more qualified customers standing nearby. Y’all, I’m not even in the right decade (or even close to the right decade) to qualify for the senior discount, and she didn’t even ask first. I kid you not, that vacuous sixteen-year-old stared at me, all doe-eyed and taut-skinned and my-life-has-hardly-begun-ish, and assumed that someone looking like me must be in the winter of her life. I was equal parts flabbergasted and flummoxed. Then, being stupid and all, I corrected her. I feel it’s important to note here that not only was there was no apology or acknowledgement offered, but she also looked at me much like I look at my students when I suspect they’re lying to me. She said nothing, but punched something in her register, and then asked for over three times as much for the very same cup of coffee that was now merely a coffee for the middle-aged. But at least I took a stand for my age. This comforting thought brings me none. To add insult to injury, I had to get back in my minivan and share my story with LCB, who was working intently on his computer. After all, it was sort of hilarious. He stopped what he was doing, asked a couple questions of clarification, and howled. “Oh, you have to write about this,” he gasped between spasms of laughter that shook the van. “I don’t particularly want to,” I retorted, no longer laughing. “Oh, but you have to,” he said, and reminded me of my I’m Living with a Senior Citizen post I was once so quick to share with the universe. But I realized that this has never, ever happened to me at Starbucks. Those people know how to do it. I walk in, and there are no age assumptions, no vacuousness, not a hint of impassivity. They are clear on their mission: to wake me up via caffeine and supernatural levels of employee perkiness, and to make me walk out feeling slightly better about my life than when I walked in. Really, I never thought about it before, but my baristas make me feel like I could totally be in the spring of my life. Like I could be a doe-eyed, taut-skinned, my-life-has-hardly-begun-ish cashier at a fast food establishment, for instance. Like, if they were serving me merlot instead of a caffe americano, I’d totally be carded. It occurs to me now that I love them. So, I’ve decided to represent them, to do everything I can to support a company that has never, ever made me feel significantly older than I am. 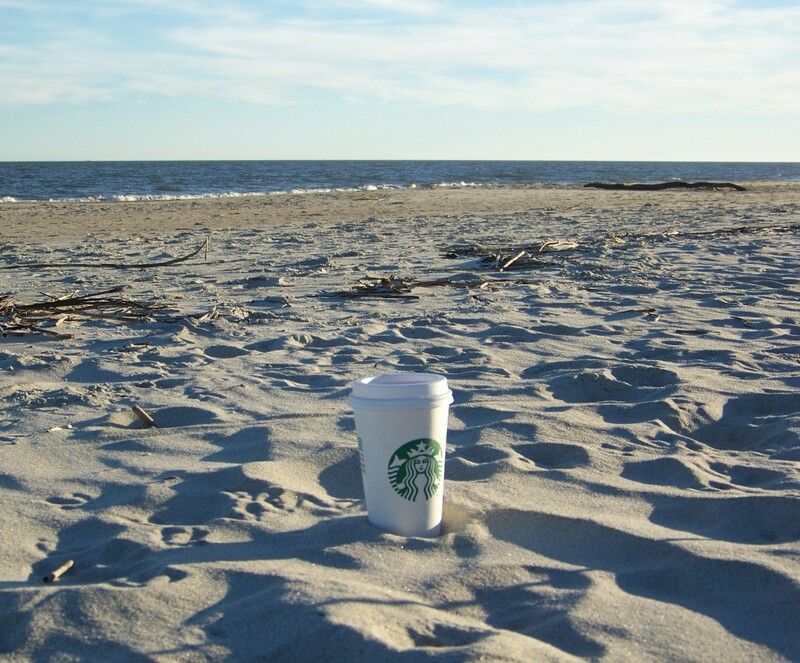 In 2015, Starbucks is picking up An Island Mom. Now, I just need to let them know what they’ve done.